Locking pliers that fold away make the Leatherman Crunch unlike any multi-tool available today. The Crunch clamps up to a 1 in. Dia pipe and if you remove the adjusting screw, you'll find a hex-bit adapter built right in. With locking blades that release with the push of a button, the Crunch will take a bite out of any job. 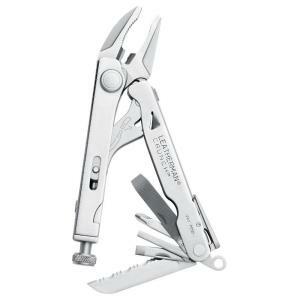 Tbook.com crawls the web to find the best prices and availability on Leatherman and related Tools and Hardware products like Leatherman Tool Group Crunch 15 Heavy-Duty Multi-Tool with Locking Pliers. For this page, related items include products we find that match the following keywords: "Leatherman" at our vendor partner Home Depot. Leatherman Tool Group Crunch 15 Heavy-Duty Multi-Tool with Locking Pliers is one of 14 Leatherman and related products listed in the Tools and Hardware section of Tbook.com If you have any questions on this product, please give us a call at 734-971-1210 during the hours of 9am - 5pm EST for assistance. Thank you for shopping at Tbook.com, the Internet Department Store!